And that’s a wrap! The swing of the Rise of the Rest tour through Richmond, Raleigh-Durham, Charleston, Atlanta, and New Orleans gave us a new perspective on the emerging entrepreneurial hotbeds of the American South. Along the way the Revolution team was joined by entrepreneurs, civic leaders, business and academic leaders, students, and many others who helped us shine a spotlight on these thriving startup ecosystems. In Richmond Governor Terry McAuliffe, Senator Mark Warner, Senator Tim Kaine, and other local political, business, and civic leaders joined us for a discussion about the past, present, and future of Richmond’s startup economy. We also had the opportunity to visit New Richmond Ventures, Evatran, and Ledbury while taking a trolley tour of Richmond’s historic downtown. WATCH as Steve trades his bus for a wireless-powered car from Plugless Power. And Derek Anderson of Startup Grind moderated a fireside chat with Steve at the Gottwald Playhouse before the pitch competition got under way. 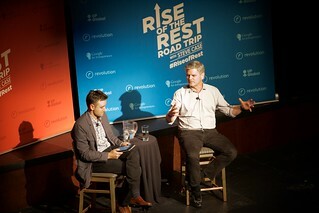 Pictured: Steve Case with Frank Gruber from Tech.co during the fireside chat in Raleigh-Durham. The Richmond pitch competition winner was WealthForge, a broker-dealer focused solely on online private placements founded by University of Richmond graduates Fred Bryant Jr. and Mat Dellorso. WealthForge offers a full suite of online investment products that touch on every aspect of the new, online private equity marketplace and more than $50 million dollars has been invested using the company’s platform. A big thanks to our Richmond judges who joined Steve, including Aneesh Chopra of Hunch Analytics and former U.S. CTO, our own Tige Savage, Ting Xu of Evergreen Enterprises, Aaron Montgomery of Carlotz and Eric Edwards of Kaleo. Our second stop was Raleigh-Durham where Governor Pat McCrory hosted Steve and the Rise of the Rest team for a breakfast at the Governor’s Mansion to discuss the importance of startups to the Raleigh-Durham region. We then headed to American Underground and HQ Raleigh for visits with local startups. Frank Gruber of Tech Cocktail sat down with Steve for a fireside chat at the Carolina Theatre. Later that night Steve threw out the first pitch at Durham Bulls game (it was a strike). WATCH as Steve samples some of Carolina’s best barbeque during a startup crawl at the American Underground campus in Raleigh. At the Raleigh-Durham pitch competition, winner ArchiveSocial wowed the judges. Founded by Anil Chawla, the company enables organizations to automatically capture, retain, and produce business-grade records of their social media activity for legal and compliance. Judges included Steve, Frank Stasio of NPR, Sarah Yarborough of Raleigh Denim, J.D. Harrison of the Washington Post, and Talib Graves-Manns of American Underground. 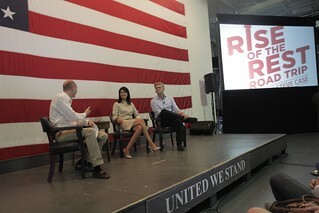 Pictured: Governor Nikki Haley, Steve Case and Patrick Bryant at the fireside chat aboard the USS Yorktown. In Charleston we visited the founders of People Matter, Harbor EC, Rewined Candles, and Levelwing. WATCH the Rewined Candles team gives Steve a lesson in glass cutting. And later that afternoon aboard one of the most dramatic venues of the tour, the USS Yorktown, Governor Nikki Haley and Steve sat down together for a fireside chat where they discussed the importance of startups to the Charleston region with Patrick Bryant, co-founder of The Harbor Entrepreneur Center. The USS Yorktown also served as the backdrop for the Charleston pitch competition – which was, to our knowledge, the first pitch competition ever to take place aboard an aircraft carrier. 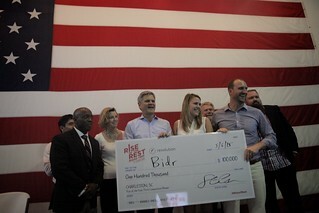 Bidr – a platform to help fundraisers increase donations – flew away as the ultimate winner. The company’s platform aims to reinvent fundraising events for nonprofits, helping organizers raise an average of 40% more money for the causes they’re supporting. Pictured: The Bidr team receives the check aboard the USS Yorktown with Steve. Joining Steve as judges in Charleston were Eric Bowman of Sparc, Sallie Krawcheck of Ellevate Network, Herbert Drayton III of Vertical Holdings, South Carolina Secretary of Commerce Bobby Hitt, and our own Bobby Ocampo here at Revolution Ventures. Our fourth city on the tour was Atlanta, where we were welcomed by the teams at Atlanta Tech Village, SalesLoft, YikYak, Cardlytics, and MailChimp. We also visited Ponce City Market, OHUB, ATDC and walked the Beltline to discuss economic growth and urban redevelopment. Mayor Kasim Reed also joined us to introduce the fireside chat with Steve and Tom Foster of Inc. Magazine at the Opera Nightclub. And what’s a road trip without a few pranks? WATCH the YikYak team pull one on Steve. 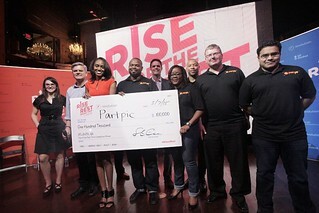 Pictured: PartPic founder Jewel Burks and team with guest judges in Atlanta. The pitch competition winner in Atlanta was PartPic, a technology that provides a simple way to find and order parts nearby or onlineusing your phone. Founded by Jewel Burks and Jason Crain, the company was a winner at the SXSW Accelerator Startup Competition this past year. Judges included Steve, Bridgette Beam of Google, David Cummings of Pardot and Atlanta Tech Village, Paul Judge of Pindrop Security and Monsieur, and our own David Hall here at Revolution Ventures. Last, but certainly not least, we ended the tour in style in New Orleans, an entrepreneurial ecosystem that has made remarkable strides in the less than 10 years since Hurricane Katrina. The day included a discussion on inclusive entrepreneurship led by Case Foundation CEO Jean Case, lunch with Mayor Mitch Landrieu, and a fireside chat featuring Walter Isaacson at the New Orleans Jazz Market. We also visited Idea Village and a high-growth startup, Federated Sample. But one of the biggest highlights of the day was a moving pitch fest that could only happen in New Orleans – aboard the “Krewe de Nieux” float which rolled down the streets of the city while entrepreneurs pitched their companies. WATCH as Steve is crowned the king of Krewe de Nieux . Pictured: President of GoToInterview Crystal McDonald with judges in New Orleans following the pitch competition. The final pitch competition of the week took place at the Jazz Market, where we were welcomed by jazz legend Irvin Mayfield. Walking away with the $100,000 investment was GoToInterview, an on-demand video interviewing platform that gives employers the ability to view a candidate’s job interview prior to scheduling an in-person interview. Joining Steve on stage as judges were Jean Case of the Case Foundation, David Hall from Revolution Ventures, and offensive tackle for the New Orleans Saints, Zach Strief. 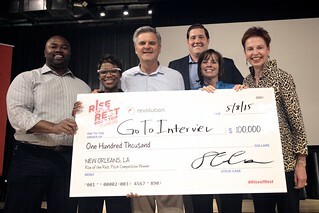 From all of the Rise of the Rest partners – Revolution, Google for Entrepreneurs , UP Global, Salesforce for Startups, Engine, Tech Cocktail, Startup Grind, Village Capital and Seed Here Studio – we extend a big THANK YOU to our hosts in each city, and congratulations to the newest Rise of the Rest companies.